Another sign of the times regarding preparing for war with Iran: Last week, the Air Force installed a new long-range air surveillance radar in the United Arab Emirates (UAE), according to the 380th Air Wing. Of course the press release on the defending airmen of the 727th Expeditionary Air Control Squadron from the Ohio National Guard makes no mention of Iran or the UAE. The radar is being deployed to the “Arabian Gulf” to an unnamed country. The 380th Wing is deployed at the hyper-modern Al Dhafra Airbase, located approximately 20 miles south of Abu Dhabi and operated by the United Arab Emirates Air Force. According to the 380th Wing’s official fact sheet, the 380th Air Expeditionary Wing was reactivated on January 25, 2002, but Global Hawk UAVs and other U.S. aircraft started operating from Al Dhafra almost immediately after 9/11. The 380th’s mission is to perform intelligence, surveillance and reconnaissance and aerial refueling, the official fact sheet says, and currently the wing is comprised of five groups and 18 squadrons. The Open Source GEOINT blog has in incomparable layout and description of the base, just in case you wondered whether there is any real secret involved here. Al Dhafra air base has been almost continuously occupied by the United States since the Iraqi invasion of Kuwait in 1990, some secret. The Air Force says the defenders have “another arrow in their quiver,” a freudian slip no doubt. I’m sure Iran sees it as an arrow. “U.S. eases restrictions on keeping citizens’ data,” The Washington Post broke last night. “U.S. Relaxes Limits on Use of Data in Terror Analysis,” now says The New York Times. “U.S. Agencies Allowed to Keep Residents’ Data for Five Years,” says Bloomberg. “Government Now Allowed to Store Info on Innocent Americans,” says Antiwar.com. Let the game of telephone begin: liberties stolen; privacy over. I received a copy of the new guidelines from the DNI press office at 7:53 PM last night, but I note that the 32 page document is not readily available (as of 9 AM the day after the release) on either the DNI or Attorney General’s websites. I don’t think there’s a conspiracy here, but I do think if you read the actual document and aren’t familiar with existing guidelines and the ifs, ands, and buts of government regulations, you could easily come away concerned. And thus constitutes the divide, the divide between Washington and the rest of the nation, between the national security imperative and the colloquial understanding of liberty as practiced by the rest of the country. The usual suspects of the civil liberties industry (and I don’t mean to disparage them) and the anti-government set (from gun-toters to olive-branchers) will decry; talking heads promoting public slumber will counsel calm; the media will muddle. Meanwhile the government’s lawyers will satisfy themselves and reassure – as they did in their tortured legal justification sanctioning the summary assassination of an American citizen – that it’s all in accordance with applicable laws. If you’ve got nothing to hide, what’s the problem?, the agents of idiocy will bellow. It’s all pretty straightforward, except that these rules only apply to the National Counter-terrorism Center. And they leave open possibilities – indeed the likelihood – that the national security establishment will over-reach, that an overzealous someone will bend and stretch the rules and their intent, heck, that this has already been done, is already being done, which is why new Guidelines were required. The NCTC, the Guidelines say, receives its information from federal, state, local governments and “other sources,” “other entities,” “data providers,” none of whom are named. Any abuses, in other words, will take place elsewhere. As long as Washington is lost in its terror war, as long as the intelligence community remains beyond accountability, as long as lawyers justify anything as legal, what is already happening in America will continue to happen. It isn’t a government conspiracy; it’s an American erosion occurring because we haven’t figure out yet either how to deal with the abundance of information the government feels justified to collect and analyze and we haven’t figured out how to deal with the basic criminal threat that terrorism represents. The New York Times scoop on the recently concluded “Internal Look” military exercise involving war with Iran seems another alarm bell signaling imminent war, while also at the same time constituting an intentional leak to communicate caution both to Israel and the administration. According to The Times, the exercise, which included an Israeli first strike on Iranian nuclear facilities, escalated to a regional war between Iran and the United States. No one needs a sophisticated exercise to come to this conclusion, so the real questions are: Why the leak? What was Internal Look really trying to practice? And most important, what did The New York Times miss in its reporting? Some background: Internal Look is a biennial (held every other year), unilateral Central Command (USCENTCOM) battle staff exercise. Unilateral meaning it is a U.S. exercise; battle staff exercise meaning it is a computer assisted command post exercise to train headquarters and components staffs in doctrine and procedures pertaining to a major Middle East war. Over the years, Internal Look has been CENTCOM’s number one training priority and its primary mission rehearsal for theater level conflicts. From Internal Look 90 (1990) through 02, the exercise focused almost exclusively on Iraq. Internal Look 90 was the first exercise to supplant a Cold War scenario involving a Soviet invasion of Iran scenario. In December 1989, the JCS authorized CENTCOM to shift the geographic focus of the upcoming game from defense of Iran to defense of Saudi Arabia. Internal Look 90 thus began as an exercise to test the military’s ability to respond to an incursion by Orange Forces from the north down through Iraq to seize control of Saudi oil fields. Given that Saudi Arabia, unlike Europe had no pre-positioned war stocks, no road network, and no water, logistics planning ended up being the major preoccupation. The exercise commenced on July 9th, and before it was over on August 4th, Saddam Hussein invaded Kuwait. Though many officers at CENTCOM’s Florida headquarters and at Ft. Bragg, North Caroline could not even pronounce the names of the towns in Saudi Arabia and were still scratching their heads over the problems identified in moving the forces to the area, they never even had the opportunity to remove the maps of Iraq and Saudi Arabia from their map boards when the invasion occurred. Urban legend has it that Internal Look 90 thus presaged an Iraqi invasion – it did not – but there is no question that it ushered in the Iraq era, or more centrally, the oil era, which is to say, that protection of Middle East oil assets and flows became the priority U.S. military focus in the 1990’s as each subsequent exercise honed the defense of Saudi Arabia and the oil routes scenario. By the time Internal Look 03 was held in December 2002, the focus was unambiguously a practice implementation of OPLAN 1003V, the war plan for Operation Iraqi Freedom. Internal Look provided the venue for the Air Force, Marine, Navy, and special operations commands to each examine their plans. The major outcome of the exercise was the success of the Army commander to convince General Tommy Franks to provide him a minimum of forces to execute what was called the “running start option” for an Iraq war. The attack would focus on Baghdad command and control as the center of gravity; a simultaneous and synchronized ground attack from multiple directions aimed at isolating the regime within Baghdad and ultimately at striking sites in the city. The official history talks of a “rolling transition to stability operations and support operations” as ground forces advanced on Baghdad. The U.S. would be welcome as liberators and the rest would be history. After 9/11, most high-level CENTCOM exercises, including Internal Look, morphed to operational tasks associated with ongoing fighting in Afghanistan, Iraq and the global war on terrorism (GWOT). 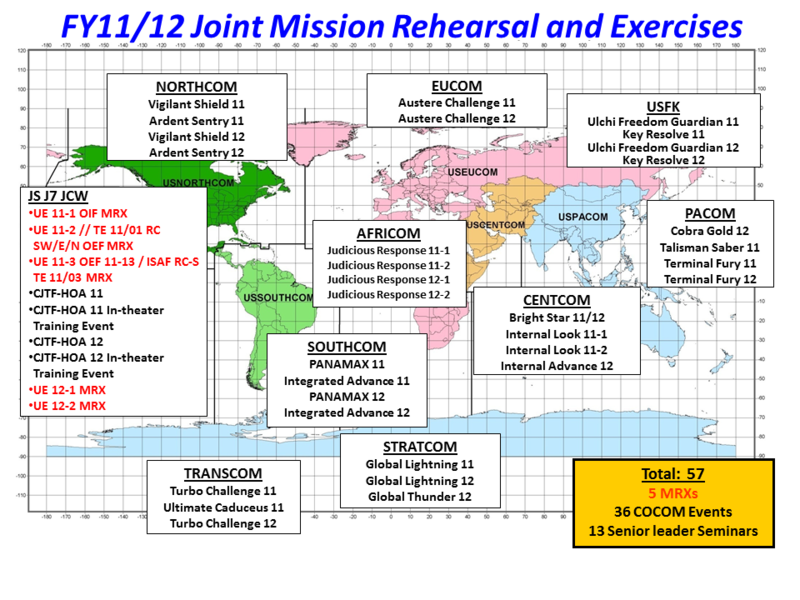 Mission rehearsal exercises for each new deployment, and each revision of strategy, were called the United Endeavor series. Desert Sailor became the mission rehearsal for the Proliferation Security Initiative Maritime Intercept Operations (PSI-MIO). All along, CENTCOM commanders pushed for refocusing the exercises for potential future operations, but the reality was that the requirements of real war and even the operational tempo of the staff inhibited such a shift in planning or development. A new exercise, Internal Advance, was added to focus on lesser contingencies (so-called “tier II” scenarios). Joint Chiefs of Staff Powerpoint slide from 2011 showing major mission rehearsal exercises and large scale exercises worldwide of the various combatant commands. The last Internal Look exercise of this series (Internal Look 09) replicated a humanitarian assistance and disaster response scenario; in other words, for all of the grinding of teeth about the Bush administration’s sneaky plans for war with Iran and October surprises, Iran didn’t become the focus until the Obama administration. So that’s it? The staff’s time is now freed up to focus on a new “tier I” major war and Iran’s it? This is the way thing work on the inside; it isn’t that anyone is particularly rooting for a war; it isn’t as if the order has come down (as it did with Bush in 2002) to prepare for an offensive war. But it is the case that Iran is now the focus of planning and that precipitates changes and revisions and scenarios and deployments all of which build up a greater likelihood of war. It seems to me that The Times got the story of the war game but missed the story of the war, how the dynamics of an idle planning staff steers the United States ever so slightly in a certain direction. The U.S. military command responsible for the Middle East is augmenting its Iran war-planning and intelligence analysis staff at a time when navy minesweepers are going to the Persian Gulf and there is an increase in other naval defenses. The U.S. has also quietly deployed Patriot missile batteries to the Gulf for possible conflict with Iran. So while all eyes in this stand-off might be focused on Iran’s nuclear pursuits and Iranian actions, there are American defensive measures as well, some open and some not so open, that also provide stimuli. Each move and counter-move can intrinsically escalate tensions; so much so that that the nation’s top military officer is speaking openly about Iranian misjudgments of either American intentions or the purpose of American defensive preparations. In an interview with Charlie Rose last week, Gen. Martin E. Dempsey, chairman of the Joint Chiefs of Staff, warned that Iran could suffer the consequences of misjudgment. “There are some things that we know they will respond to,” Dempsey said. Dempsey was mostly warning that Iraq “could get it wrong and suffer the consequences,” as he said, describing U.S. (and Israeli) will to act if it defies the international community. But rationality is obviously on Dempsey’s mind. I’ve been writing for at least five years about U.S. war preparations for Iran, and in 2006, I wrote that “on the surface, Iran controls the two basic triggers that could set off U.S. military action.” Those then were acquisition of nuclear capability in defiance of the international community and lashing out militarily at the United States or its allies, or closing the Strait of Hormuz to international oil traffic. Not much has changed in five years and it’s always useful to remind ourselves that Iran’s imminent acquisition of nuclear capability has been imminent for too long to qualify any longer as imminent. But five years ago, the United States was overwhelmed by a war in Iraq and most of the writing about an Iran war focused on the Bush administration and its irrationality. Five years later, Bush is gone and Iraq is no longer a resource-sucking military albatross for the United States. Does that mean then that war is more likely today – this week, this month, in the next six months – than before? Well one thing is clear: Iran still holds most of the cards. So when I hear that CENTCOM’s Joint Intelligence Center has stood up an Iran Integrative Assessments Team, and that the planning staff in Florida is redoubling efforts to assess Iranian strategy and military capabilities, I’ve got to ask myself if there’s something I’m missing, something that’s going on behind the scenes that makes this time anything other than contingency planning as usual. Though both the United States and Israel have the ability, with conventional, nuclear, or cyber weapons to mount a tactical surprise attack upon Iran – and that’s why it’s easy for so many to endlessly speculate about attacking that (or any other) country — at least for the United States, there is a certain cycle of preparations, a certain time scale of preparations, that are really necessary. It even took the United States almost a month to attack the Taliban and al Qaeda after 9/11 and a lot of the reasons had nothing to do with Afghanistan’s geographic isolation or the absence of a plan. The reality of war was the need to get everything prepared. But when the responsible command CENTCOM starts to work on “conceptualizing, directing and executing long-term research and all-source analytic production on Iranian strategy, calculus and military operational capabilities,” which is what the Defense Intelligence Agency personnel stationed at the Florida headquarters are now doing, it seems more methodical and serious than deployments here and there. The Integrative Assessments Team, according to DIA papers, is supporting CENTCOM’s “analytic activities on Iran’s strategic calculus, operational art and military resource decision-making” in support of war planning. The ducks are indeed being prepared, even if they are not being put in order yet.